Last night’s 400 IM National Champion Megan Pierce of Williams made a statement by racing to the top seed in 2:00.68 in heat four. She came in to the meet as the eleventh seed at 2:03.87 and used an opposing approach to that of her IM. While she brought a patient force last night, Pierce went after this race right from that start splitting a 57.19 at the 100. She definitely has even more room to improve as well as her fourth 50 was a 32.58. Freshman Anne Dassow claimed heat three in 2:02.61 which was just off her seed but exactly what she needed to do to make it back in the top eight for tonight. She sits seventh headed into tonight. St. Thomas sophomore Katelyn Strauss claimed heat five this morning in 2:02.00, a big time drop for her. She went out similarly to Pierce but could not hang on in the back half. Also in the mix tonight will be RPI’s Shanny Lin who swam a more typical 200 fly race and certainly has the race experience in this event to be well-prepared. She definitely has more left in the tank for tonight after going a 2:02.18 this morning. Junior MIT Engineer Mary Thielking kicked things off early racing to a 2:04.04 out of the early heats of this event. Her efforts were good enough to secure a spot in tonight’s consolation final. This was nearly a two second drop for Thielking. She will be joined by Denison’s Halli Garza in this heat who came in as the top seed but fell to ninth this morning. Just a sophomore, Brandon Lum of Washington University will be tonight’s top seed in this event. Out a 50.43, Lum can still work on his second 100 to go even faster tonight. His time was a best by over two seconds. NYU junior Ian Rainey threw everyone for a bit of a loop this morning by claiming the second seed out of lane one in heat one. The second to last seed coming in, Rainey swam a time faster than the winner of this event last year. After earning runner-up honors in last night’s 400 IM, Rainey will be looking to earn his first D-3 National Title tonight. Bouke Edskes of MIT took the third seed at 1:47.64, another best time out of this field. Emory and Kenyon each put one swimmer in the A final in Christian Baker (1:48.14-5th) and Jonathon Zimdars (1:48.67). The Lords also have junior David Perez in the fourteenth seed. Defending champion in this event Emma Paulson will be the third seed with a very solid 55.07 this morning. Paulson was out fast enough this morning but fell off on the last lap. Despite falling short to Olson this morning, Williams’ Olivia Jackson swam a 55.35 to qualify fourth out of heat three. She will faster tonight for sure. Emory will have a third swimmer in this final as Claire Liu had the fastest first 50 in the field this morning and the sixth time overall. Emily Rollo of Washington and Lee will round out the top heat tonight after finishing in a best time of 55.75. Union’s Christina Belforti took the sixteenth seed with a 56.25. NCAA record holder in this event Ben Lin cruised to a 47.75 top seed this morning. Clearly using a relaxed approach, the men’s 100 back will be on record watch later on tonight. Lin split 23.00-24.75. NYU’s Chad Moody blasted a 48.23 for the second seed out of heat four, and was followed by Kinglsey Bowen of Tufts and Emile Kuyl of Johns Hopkins. Emory’s Sage Ono was also out slower than usual splitting 23.49-25.18. Both fifty splits will be much faster tonight as he will be a contender for the top three. Kenyon and Denison each placed a swimmer in the consolation final. Ben Baturka will swim for the Lords (49.21 – 11th) and Jason Wesseling will swim for the Big Red (49.32 – 12th). Taking sixteenth in this event was Christopher Szymczak of Wheaton (Il). Defending champion Samantha Senczyzszyn swam a great morning time of 1:01.88 with no one within a second of her in her heat. She will be given a run for her money tonight though, so you can expect an intense race to come. 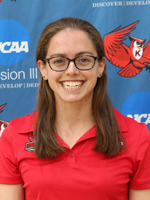 She will be challenged by Denison freshman Kt Kustritz who has had a standout freshman season but will be looking to make up for a disqualification in her prelim heat of Wednesday’s 200 IM. Her 1:02.25 also looked smooth. Her splits were nearly identical to Senczyszyn’s so it appears that the two had similar strategies this morning. Emory sophomore Hannah Lally made her mark in this event by going a 1:02.58 for a one second drop. Kenyon’s Julia Wilson was close behind in 1:02.69. Springfield senior Emily Medeiros has the most experience in this event at the NCAA level and will also be one to watch. Caroline Conboy of William Smith took the sixteenth seed in 1:03.91.